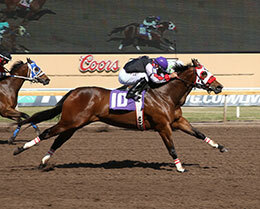 Our Lady Wagon (#10), ridden by Jorge Torres, wins the allowance feature on Sunday at Remington Park. OKLAHOMA CITY, OK—APRIL 14, 2019—One horse had qualified for last year’s $3 million All American Futurity and another horse had run second in the $750,000 Ruidoso Derby in 2018, but in the end, it was a horse that had never even run in stakes company that prevailed in Sunday’s featured allowance race at Remington Park – Our Lady Wagon. It didn’t matter to the 4-year-old mare from the barn of trainer Stacy Charette-Hill that she was running against such class horses. This daughter of Pyc Paint Your Wagon, out of the Mr Jess Perry mare Little Kool Barbie, just jumped out of the gate on top and never was headed to win this $30,650 allowance race by a head at 6-1 odds. Jockey Jorge Torres was up for Charette-Hill and owner Kent Jackson of Elk City, Okla.
Tracked by more than 153,000 fans on Facebook and more than 9,900 Twitter followers, Remington Park has provided more than $216 Million to the State of Oklahoma general education fund since the opening of the casino in 2005. Home to the historic Grade 2 Oklahoma Futurity, to be run for the 78th time on March 23, 2019, Remington Park is located at the junction of Interstates 35 & 44, in the heart of the Oklahoma City Adventure District. For more information, reservations and group bookings please call 405-424-1000, 866-456-9880 or visit remingtonpark.com.